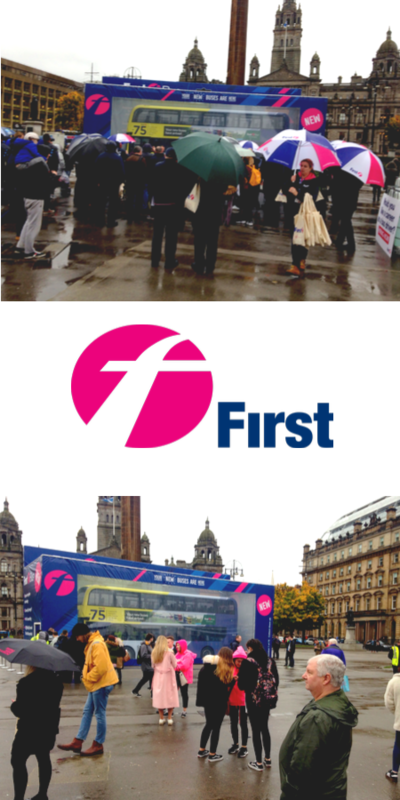 After a successful Freshers campaign for First Bus, we were excited to be asked to support the launch of their all new, environmentally friendly First Glasgow Eco Fleet. The launch campaign was simply fantastic; the world’s largest model bus display! The new state of the art vehicle was the centrepiece of the campaign and it certainly was a showstopper! Our role was to source the very best talent in the promotional world who could add value to the event. As we always say, at the heart of every great campaign is great staff. In order for the campaign to be a true success it required exceptional staff who were experienced and trained to engage and educate the public on the new bus, whilst representing the brand image and key values. BAM have an extensive database of experienced and talented staff across the UK. We provided a team of 5 super special promotional staff to support the event. Our team was in charge of creating a buzz, raising awareness and delivering key messages through interaction with the public via flyering and data capture. With an outdoor event such as this we always hope for a sunny day. The weather did however let us down but as the heavens opened, our team were out in full force and continued to deliver exceptional results for the client. Entertainment came in the form of Capital FM who were running competitions to win free travel, iTunes vouchers and confectionery. The Glasgow Warriors stopped by to for unique photo opportunities and two give out further prizes, and if this wasn’t enough for the lucky crowd, the First Bus Merchandise team were on hand providing children special goody bags. The cherry on the top was the appearance of Andrew Jarvis and Anna Richardson who took the stage to say a few words and cut the compulsory ribbon, declaring the new bus officially open for business. It was a fantastic launch and an extremely successful event for First Bus. We were privileged to be a part of the campaign and with more new buses expecting to be launched on other routes in the very near future, we look forward to supporting First Bus again.